As a long time member of the SCA I have been involved in making award scrolls in the style of the great manuscripts of the Middle Ages and Renaissance for many years. This is the first in a series of video lessons I am making on how to paint in the style of these masters. 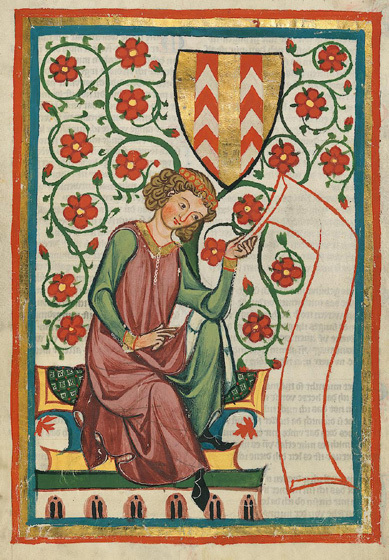 The Manesse Codex, also known as the Grosse Heidelberger Liederhandschrift, was written and illuminated between 1305 and 1340 in the area we now call Germany. It was a collection of songs by the Minnesingers (minstrels) about the knights and lords of Germany. These amusing stories were very popular with the common people in the same way that Robin Hood songs were popular in England. They were illuminated with 139 pictures depicting the wealthy at play, hunting, courting, fighting, dancing, playing music, dining, and shopping. These pictures are perfect for painting on scrolls, banners, and other objects. In this video I demonstrate how to trace the image without using a lightbox. This is a helpful technique when the background is too dark or the paper is too dense for tracing. In the second half I demonstrate painting the draped clothing on the figure in three main steps. The video is 38 minutes long. The drapery painting begins at 18 minutes if you want to skip ahead. Since this video is posted to the public on YouTube you may share it on Facebook, Google+ and other social media as much as you want. If you are inspired to create a painting from this manuscript, too, please share a picture of your work with me and I will attach it to this article. If you want to add this article to your list of favorites or email it to a friend, please use this permanent URL, https://stores.renstore.com/-strse-template/1205A/Page.bok. Permission is granted by the author to quote from this page or use it in handouts as long as you include a link back to Renstore.com.